Supreme Court Rejects 2 N.C. Congressional Districts As Unconstitutional The Supreme Court on Monday upheld a lower court ruling, which found the two districts had been unlawfully drawn to diminish the voting power of African-Americans and ordered them redrawn. 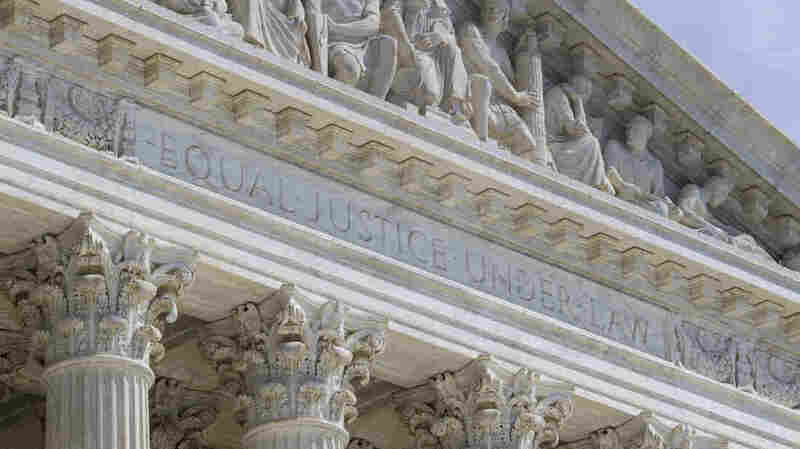 For more than a quarter century, the Supreme Court has been struggling with the question of race and partisanship in drawing both state and congressional legislative lines. In 1993, the court said partisanship is permissible, but redistricting based on race is not. Since then, the question, increasingly has been how to tell the difference, especially when party affiliation correlates with race, as it does in much of the South. In North Carolina, for instance, roughly two-thirds of white voters cast their ballots for Republicans, while some 90 percent of African-Americans vote Democratic. With Republicans controlling state legislatures throughout the South, experts say the Supreme Court has handed Democrats and civil rights advocates a powerful tool, reviving racial gerrymandering claims once thought futile. "This case is a big deal because it's going to make it much easier for voting rights plaintiffs, especially in the American South, to challenge gerrymanders that are done by Republican legislatures," says Richard Hasen of the University of California, Irvine. The court's decision centered on two congressional districts that previously contained a substantial percentage of African-American voters, but not a majority. After the 2010 census, however, the GOP-controlled North Carolina Legislature reshuffled tens of thousands of black and white voters into and out of the two districts, one around Durham, and the other in a different part of the state snaking from south to north. Writing for the court on Monday, Justice Elena Kagan said the redistricting deliberately concentrated black voters in the two districts and diluted their voting clout in neighboring districts. By a unanimous vote, the justices rejected North Carolina's argument that it was required by the Voting Rights Act to create these two majority black districts. And by a 5-3 vote, the court found that the evidence in the case "debunked" the state's contention that in setting racial targets, it was acting not with any racial motive, but only for partisan advantage. Justice Clarence Thomas, the court's most conservative justice, and its only African-American, cast the decisive fifth vote, joining the court's four liberal justices. He agreed that the court correctly deferred to the lower court's "plausible" interpretation of the evidence. In addition to the practical consequences that Monday's ruling could have for redistricting in North Carolina in 2018, and in the rest of the country after the 2020 census, there is a fascinating political twist to the North Carolina case. In 1993, it was conservatives who first challenged the state's redistricting plan, arguing successfully that race played an unconstitutionally large role in drawing district lines. Liberal Democrats hated the decision back then; conservatives loved it. But now the sides have flipped, observes UC's Hasen. "This is a transformation of the racial gerrymandering cases," he says. "It went from a tool being used by conservatives to stop the creation of majority-minority districts to now a tool to try to police Republican gerrymanders in Southern states." But what of purely partisan gerrymanders, especially in the rest of the country? In 2004, a four-member Supreme Court plurality all but ruled out challenges to even extreme partisan gerrymanders, while four members of the court would have allowed some limited challenges. Justice Anthony Kennedy cast the fifth and deciding vote, declaring that he might someday embrace a challenge to a partisan gerrymander if someone could come up with workable standards. Now there is a case from Wisconsin waiting in the wings at the Supreme Court — a case in which the plaintiffs purport to have found such a workable standard. So, as long as Justice Kennedy remains on the court, the possibility of limiting partisan gerrymanders remains a live one.